The single version of Tie Your Mother Down might be the hardest rocking song that Queen every put down on vinyl (at least that’s our opinion). The 4:48 second album version is also outstanding in it’s own right with the one minute Brian May guitar solo at the beginning, but when you are looking for a song to start out hard and rock all the through, the single really stands out. 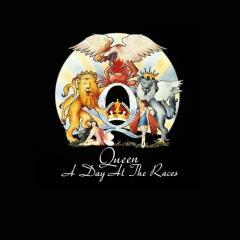 A Day at the Races is the 5th album by Queen and included the major hit Somebody to Love by Freddie Mercury. The best part of the movie Ella Enchanted is when Anne Hathaway has to preform a song for the giants and she does a version of Somebody to Love. Another great single off of the record is Good Old Fashion Lover Boy. By listening to the diverse sound that each song on the album delivers you can completely understand why Queen is in the Rock and Roll Hall of Fame and considered one of the greatest rock bands that ever was and even today without Freddie Mercury still is. On Tie Your Mother Down as with many Queen songs the drumming of Roger Taylor plays with the music versus trying to have the drums overwhelm the song. This along with the smooth bass playing of John Deacon allow Mercury and May to blast out this rocking classic. Before you decide to hit the play button on the video below please make sure your volume is turned up to it’s max. This entry was posted in A Day at the Races, Classic Rock, Forgotten Rock Classics, Forgotten Songs, Hard Rock, Music, Queen, Rock Band, Tie Your Mother Down and tagged Brian May, Classic Rock, CS5711, Forgotten Rock Classics, Forgotten Songs, Freddie Mercury, Music, Queen, Record, Rock Music, Song. Bookmark the permalink.